Foobot is a high quality indoor air monitor and meter (tester) that is portable and extremely user-friendly. 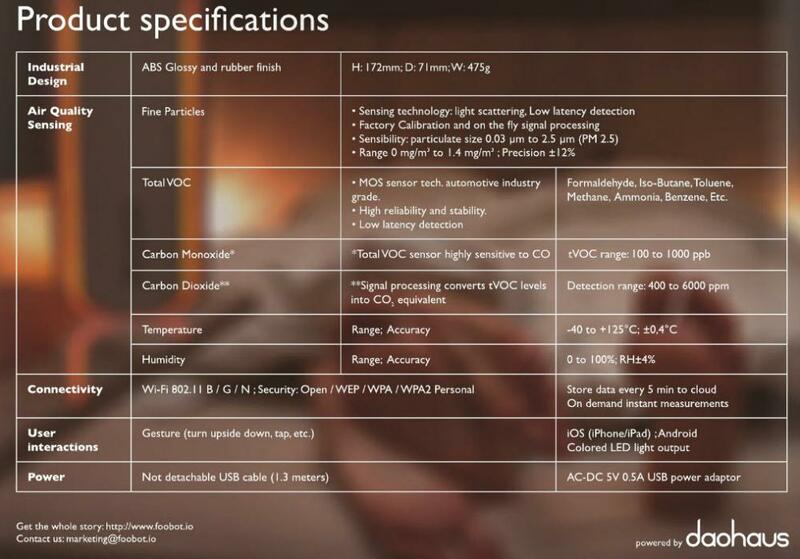 The system monitors 1. total volatile organic compounds (tVOC) including Carbon Monoxide, an odorless yet very harmful chemical, 2. particulate matter (PM2.5), 3. carbon dioxide, 4. humidity, and 5. temperature. Free app from App Store or Google Play allow you to understand the air quality in your home and to flag you when it may need attention. Excellent way to keep an eye on your air quality while at home or away. Foobot monitors the most important pollutants such as Volatile Organic Compounds, Particulate Matters and give you real time data. All you need to understand is that Blue is Good, and Orange is Bad. That's all. The idea is to help you understand how you can keep your home healthy and safe. Understanding your indoor air quality will help to regulate an optimal healthy environment by utilizing air purifiers effectively. 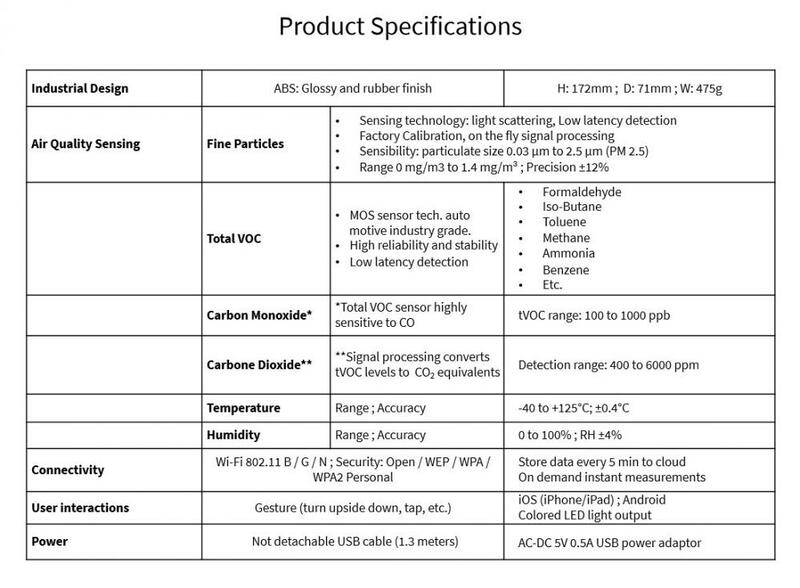 Foobot Indoor Air Quality Meter and Monitor Spec Sheet by clicking here. Foobot Indoor Air Quality Meter and Monitor Sensors & Features by clicking here. 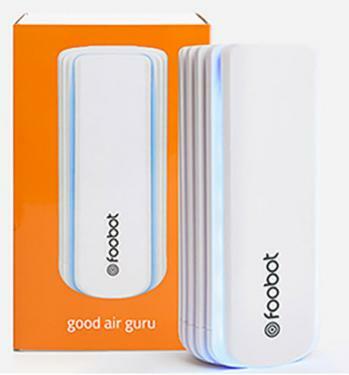 Foobot Indoor Air Quality Meter and Monitor - How it Works by clicking here. Foobot Indoor Air Quality Meter and Monitor - A Closer Look into How it Works by clicking here. Foobot Indoor Air Quality Meter and Monitor - View the Detailed Spec Sheet by clicking here. Foobot Indoor Air Quality Meter Resource Center by clicking here. 5.0 You might be surprised with your air quality! Get a Foobot! 11/05/2018 By Chad Siebenaler I purchased on of these to monitor air quality from 3D printers. I learned first that my "furnace filter needed a change". I changed furnace filter and VOC and Particulate dropped immediately. I purchased from US Air Purifiers, which was excellent. They actually have very smart people guiding you on products! In any case the unit helped me design the "Air scrubber setup" in my basement. My results matched that of industry studies.